BrightPay 2018/19 (effective for pay periods on or after 06th April) is available to download from mid March 2018. 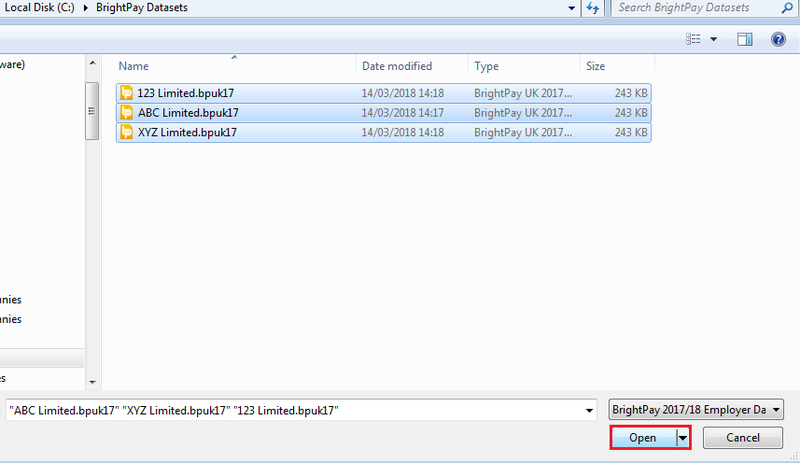 2) Open the BrightPay 2018/19 software. 4) Browse to the location of your 2017/18 employer data files, highlight the employer data file and simply select Open. Hold the Shift key on your keyboard and select the first and last employer data file that you wish to import and all employer files within the start and end range will be selected. Hold the Ctrl key on your keyboard and individually select the employer files you wish to import. 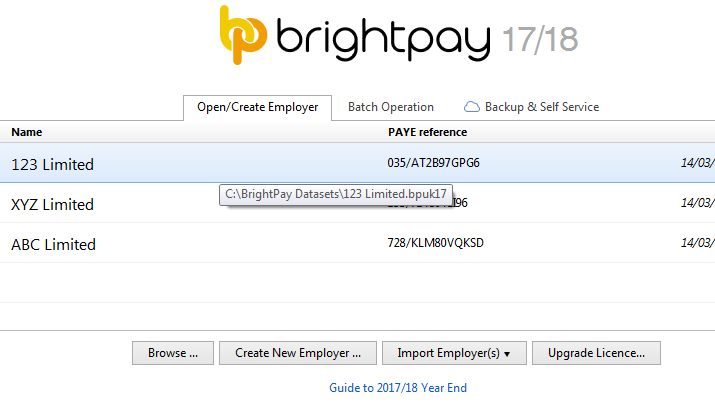 7) All selected 2017/18 employer files will now be imported into BrightPay 2018/19 and will be listed in the 2018/19 Open Company screen. 8) Please note: if the employer file is password protected, the password will be the same as the previous year. Please note: All employee data records will be reset for the start of the new tax year and all associated 2018/19 budgetary changes will be applied as per HMRC instruction. Carry forward the authorised tax code from the employee's 2017/18 payroll record to their 2018/19 payroll record. Authorised codes include BR, SBR, D0, SD0, D1, SD1 and NT. However, if you have received a 2017/18 tax code on a form P6 too late to use in 2017/18, carry forward this code instead. Please note: BrightPay will automatically uplift all L codes by 35, all M codes by 39 and all N codes by 31 and will remove any Week 1 or Month 1 tax marker on import from 2017/18 BrightPay into 2018/19 BrightPay. • update any tax codes where you have received form P9(T) or other tax code notification after you have set up your payroll records.